It seems Google is working on a dedicated Google Now Widget for Jelly Bean 4.2.2, the Androidcentral claims that it spotted the same on Google Support pages. However as of now the Google Now has been pulled of by Google from its support pages. If it is a indeed a reality then you can place the Google Now widget on your home screens for easy access on your Nexus 4 and Nexus 10 devices. The Jelly Bean update which was spotted on Galaxy Nexus may have this widget but it is unconfirmed till now. The widget apparently "displays a summary of your current Google Now cards either on the Home screen or the Lock screen". 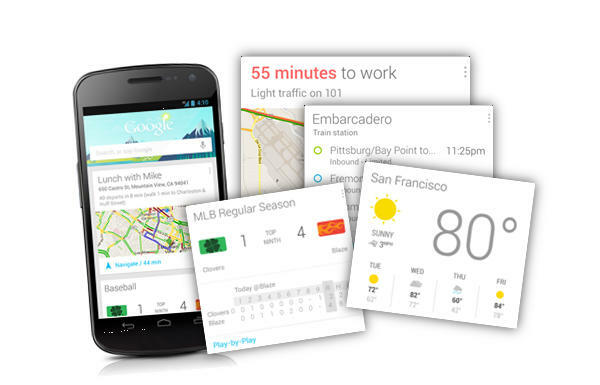 Fans of Google Now will no longer need to open up the service and wait for the tiles to give relevant information. The widget will display all the information you need on your home screen as well as lock screen. By the looks of it, the smart phone market is headed for many twists and turns and updates. This may be the year of Updates as far as all things mobile are concerned. Anyways, the widget is quite useful on you home screen. But the speed with which Google pulled out the webpage on support points to only one thing. It is under process of launch and Google doesn't want it competitors to get a hint. Hope to see it soon all future devices.